Chicago Train Accidents | Power Rogers & Smith, L.L.P. Power Rogers & Smith has not only been honored with one Best Law Firms designation, but five! This is a rare and exclusive legal honor limited to the top 100 attorneys in the US, and we are proud to have three of our attorneys included. Membership in this organization is invitation-only, and extended only to the very best trial lawyers who display the highest degrees of professionalism and ethics. All three of our firm’s partners have been included in the list of The Best Lawyers in America for exceptional representation of plaintiffs in cases. Membership is invitation-only and only extended after a careful vetting process during which lawyers are evaluated on criteria such as experience and integrity. Lawdragon recognizes the top attorneys in the nation based on a process of law firm nominations, votes and comments from legal professionals, and editorial research. Super Lawyers® is a prestigious rating services that recognizes the top 5% of attorneys in each state based on a process of peer review and independent research. 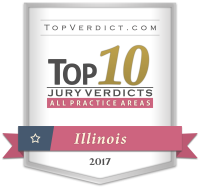 Our firm secured an $85.9 million jury verdict recognized among the Top 10 Verdicts and the fourth-largest plaintiff / cross-claimant verdict in the state of Illinois in 2017. Train accidents can hurt and even kill many people, causing serious injuries and property damage. Our team is proud to provide aggressive and skilled representation for our clients. If you or a loved one has been hurt in a train accident in Northern Illinois, it is important that you have the right representation on your side: Our Chicago train accident attorneys at Power, Rogers & Smith, L.L.P. can help you. Why should I choose Power Rogers & Smith? Our team is experienced. We have decades of collective legal experience and have been serving this firm for decades. Our team has a record of success. Our lawyers have recovered more than $4 billion in judgments and settlements for our injured clients. That's over $800 more than our closest competitor. Our team has a reputation for excellence. Although we are a moderate sized firm, for the last seven consecutive years we have led the state of Illinois for the most dollars recovered in verdicts and settlements. Our team doesn't charge a fee unless we win. No recovery? You won't owe us anything in legal fees. We don't charge until we win. Our team has the knowledge and experience to represent you against big corporations. If you or a loved one was involved in a train accident, you need the right representation: A firm knowledgeable and experienced enough to help you. Our team has the skill, knowledge, and competence to fight for your rights and pursue justice against a powerful defendant. Request a free consultation in order to learn more. Our team can fight for you. Call our Chicago office to learn more about your case and your options and to start your pursuit to justice. Attorneys: Joseph A. Power Jr. When Do I Need to File a Lawsuit? A: If the statute of limitations applies to your case, you may have a limited window opportunity to file a lawsuit. Because of this, it’s important to begin the legal process as quickly as possible. This window of time differs depending on who is liable for your accident, so speak with an attorney to learn more about the specifics of your accident and lawsuit. What Kind of Compensation am I Entitled to? A: Train accident victims may be entitled to compensation for multiple things, such as hospitalization, medical costs, future medical care, and emotional / psychological damages. Do I Need to Speak with an Attorney? A: Legally, you are not required to speak with a lawyer. If you want to truly understand your legal options, though, an attorney may be able to provide insight that you otherwise would not have. Power Rogers & Smith, L.L.P. The representation that you provided to your client was incredible. Power Rogers & Smith, L.L.P. Supports HIE (Hypoxic Ischemic Encephalopathy) Awareness Month! Since 1993 when we first opened the doors of our law practice, Power Rogers & Smith has handled some of the largest personal injury cases for plaintiffs in the state of Illinois – and won. With our experience, we aren’t afraid to stand up to large corporations and insurance companies in court. Power Rogers & Smith has won more than $4 billion in verdicts and settlements for its clients – that’s $800 million more than our closest competitor since 2000. These results include many record-setting and regulation-changing outcomes as well, including a $100 million settlement for victims of a trucking accident – Illinois’ largest injury award to a single family. Victims of tragic and life-altering accidents are suffering – physically, emotionally, and financially. We take the financial burden off victims by working on a contingent fee. This means that you do not pay unless/until we secure a financial recovery for you. You focus on healing. We’ll take care of the rest. If you or a loved one has been seriously injured, don't waste time. Fill out the form below for your free consultation. Please tell us about your injury.